DVD player is very convenient electronic devices, and some portable players now. Such as mobile phones, mobile phones and want to know more about the player's information, I suggest TradeTang, you're gonna have a lot. DVD Decrypter is a free tool which enables you decrypt and copy a DVD to your PC's hard disk. From there you can choose to watch them with the likes of PowerDVD and WinDVD or you can re-encode them to MPEG1 (VCD) or DivX. Advanced functionality can be found in the context menus affiliate programs. How can I set up DVD Decrypter to rip file from a directory? Small, simple and straight to the point. What else can you ask for. Wish they made one like this for Blu-Ray too. This program did the job. No complaints from me. DVD Decrypter is just one of a kind they don't make them like this anymore. There was a time when there was no DVD DVD Decrypter couldn't handle and still it can handle a lot of DVDs. I think it's sad that they don't update it anymore it could be nice, but unfortunately that's sometimes life too. I still use it a lot even with windows 7 it runs without any problems. I would rate way over 5 if I could, or should I say you cant rate this its too good. This is the kind of software that I can really dig. And I type this as I'm in the car from my blackberry so I know just a little about the future, you know what I'm saying? which i have used for a long time it is sad that lightning uk has to give in to "corporate pigs" anyhow best of luck mate u done britain proud... any comments will be appreciate http://besttechworld.blogspot.com/. this web is so popular and i love it. I love it very much,your pager are so popular.so many people like you!Do you want to buy a cheapnorth face jackets- http://www.outletnorthfacesale.com ,I think you will like our web too! 1. remove css protection off DVD. 2. copy dvd to hard drive. the result looks good. 1. cant convert DVD to iPod, iPhone, Xbox 360, Zune, and other portable players. There are other tools like this DVD Ripper software that can convert DVD to iPod, iPhone, Xbox 360, Zune, PSP, PS3, and other portable players. Hats off to Lightening UK for writing the BEST DVD decrypting software, and not only that but it was FREE! This should be a BIG lesson to all these large corporate software companies that charge an arm and a leg for rubbish that is full of bugs...You don't need lots of money to write decent software. Pity the hypocritical - anti piracy groups stopped this guy from writing DVD Decrypter. They haven't stopped users from decrypting DVDs, all it has done is forced us to user other software. Blu-Ray & DVD Decrypter is a powerful tool for ripping and burning DVD and Blu-ray discs. It also allows you emulating of virtual DVD and Blu-ray discs. Blu-Ray & DVD Decrypter supports wide range of optical storage medias (including CD-R/RW, DVD-R/RW, DVD+R/RW, DVD-RAM and BD) as well as a wide variety of burning hardware. 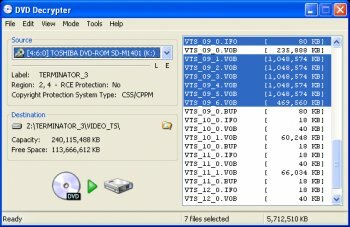 DVDDecrypter had ceased development long ago due to legal issues and Vista was nowhere to be seen as of the time when the latest version of DVDDecrypter was published. And if you're using Vista then you're 100% GUARANTEED to have lots of software written for XP that just doesn't work on your machine anyways. I mean... What do you expect? Installed, re-installed and re-installed again on my Toshiba Satellite. Every time I try and run this program it starts running and then I get one of two messages. Either Windows Vista message stating "a problem caused the program to stop working correctly. Windows will close the program and notify you if a solution is available" and then it closes and nothing. Or, a series of the following message "Parst VTSM runtime error" or it just locks my computer up. Not sure what the issue is. Anyone have any suggestions? nickfromeneabba, Thanks to Sony your VAIO probably uses a Mats***a DVD drive which are region locked and so far uncrackable by firmware or AnyDVD etc. Mats***a are the worst for this. My VAIO is the same. Once I need a new laptop I won't buy another Sony. Mats***a need their heads looking at. don't know what happens - apparently it does not work on my sony vaio laptop (worked on all other computers before...) still trying... any clue? I'm a new user of DVD Decrypter, and having trouble decrypting dvds. The audio and video are not in sync for some reason. So it feels like bad dubbing. I'm sure I missed something in set-up. i have already succesfully converted a DVD to ipod format... but when i try to decrypt a second, the mode tab is inacessable what do i do? Works fine on Vista for me. Suggest problem 'might' be if you've installed the program to "C:\Program Files\...". Vista protects software installed in this directory, and know this sometimes causes problems. Try uninstalling and then reinstalling to a custom directory eg "c:\Programs\DVD-Decrypter". (failed to set data for DVDDecrypterPlayDVDmovieonArrival). If anyone could give me a solution to this problem, I would appreciate it. I'm sure it's something simple in the settings that I overlooked. Great program! I'm a total novice to making back up dvd's so how do you compress all of the files that are created when you decrypt the dvd all into one file so that I can play it? if you have ripping problems its not this programs fault, you should look at altenatives that is in development, it has a great interface, many many options, you can rip individual episodes of tv series dvds, rip to iso, even burn iso! I haven't tried it yet, but there is also a audio file on the divd, try ripping that. Casino Royale again. Followed jakobmp28 and had to go to DVDFab HD. Copied film Ok, BUT no audio. Can anyone tell me how to get the audio? 1. At first try to rip it with DVD Decrypter. Choose a folder on the hard disk and rip/copy it to that. The program will skip through copy writes, protections and dummies such as runtime errors. Remember you’ll need around 6-8 GB of free space for preliminary storing. If it works go directly to point 3. If not, go to point 2. 2. Rip it with DVDFab HD Decrypter what’ll do the same as DVD Decrypter, but is slower, but has more sneaky and sly methods for sneaking past the copy writes and various protections. Choose a folder on the hard disk and start ripping. 3. When the ripping is finish you have an exact copy on your hard disk of the DVD movie, but… the movie is too big to be copied to an empty DVD. Therefore you have to reduce or “shrink” it a bit. Use the program DVD Shrink and choose the movie from the folder. The program will scan through the movie and give you possibilities for choosing different features to include in the shrink, fx subtitles, foreplays etc. End by choosing the button called backup to shrink the DVD. 4. Burn the shrinked movie using a compatible DVD burn program such as Nero Burning ROM or NTI DVD Maker. The programs used in this process are all except for Nero freeware. If the URL’s are to told and don’t work, just Google the programs. Just to clarify, DVD Decrypter won't even let you boot it up with Casino Royale in your DVD drive; it immediately gives you the access errors Jonny55 mentioned and then either quits or produces more and more error dialogs until you use the Task Manager to end its process. Similarly, you can't rip to an ISO with DVD Shrink either, so you can't do either one as a first step to doing the other. Has anyone out there encountered and solved the above problem? Any help would be gratefully appreciated. Thanks! 1. run dvd decrypter this removes all copy writes and will save it to your hard drive. 2. run dvdshrink this will shrink the size since the file conversion from dvddecrypter makes the movie files to big to fit on a regular dvd. 3. find the movie files from dvd shrink with your burning program and start burning! thats it! I get a runtime error when decrypting a dvd. Is there anything that can be done about this or is the fact that i am running off of Windows Vista a problem? Use DVD Shrink to burn ("Backup") after you extract all the files using DVD Decrypter. Hope this helps. I'm guessing the reason it says you're out of space is because your external drive doesn't support single files over 3-4GB. If you deselect File Splitting in the options, it should work. (Tools>Settings>File Mode>Options>File Splitting). You will have 3-8 files for one movie however. You can use DVD Region+CSS Free with DVD Decrypter to copy newer Sony Pictures movies such as Memoirs of a Geisha. Disable DVD Region+CSS Free, open DVD Decrypter, when it's ready to decrypt, enable DVD Region+CSS free and start decrypting. AnyDVD also works on some movies. Use the free DVDFab Decrypter to decrypt the movie (you may need DVD43Free - www.dvd43.com). It will decrypt the movie in several files. Copy those files into a folder named VIDEO_TS. Use a DVD Burning software such as Nero to burn an ISO image containing that folder with the video files. Then use Virtual CD to mount that ISO image in a virtual drive. Open DVD Decrypter and select the source as the virtual drive containing the ISO image. It will then combine the multiple files into one file. Just combine AnyDVD with DVD Decrypter and you can copy any newly released DVD. 1.) Use ElbyCDIO as the I/O model. 2.) Disable the structural protection removal in DVDDecrypter. DVDDecrypter will see the disc as unprotected and will continue to work... forever. I like DVD DECRYPTER but how do I back up my newer movies such as Memories of a Geisha,Secondhand Lions,The brothers grimm. These are newer 2007 movies that pop up with Fail to read or in DVD WIZARD PRO it says it finished but it's not and in DVD SHRINK it say INVALID NVIGATION STRUCTURE. out of all I like DVD SHRINK. But how do I back up these movies. Can any members advise me as how to configure the settings in these prog's to maximise successes? As I read the reviews from some of you, I thought that downloading DVD Decrypter would be a waste of my time. Nevertheless, I thought, "Why not give it a go and see for myself?". It's a good thing I did, too. After using it the first time I was amazed at how easy and very effective this program actually is. This is worth ever little mb of space on my computer and then some. I may jinx it by saying so, but this program is worth paying for, in my opinion, however I am greatful it is freeware. I most defiantly recomend this piece of software to anyone that has problems trying to burn a movie for their personal use, of course. Excellent software. I must have ripped and shared about 350 dvds using this baby, can only remember 2 problems ripping. i dont use this program anymore cause i found better. but thats not why i signed on..... just that whole kernal debugger thing might be the cause of peoples problems... might wanna back up and do a repair xp install and not use these programs if you dont want kernal debugger messed with. Hi i was wandering how u choose what files to get off the dvd? britt_ipod, Why would you give this program a low rating just because you are a moron? I have had DVD Decrypter for quite some time and has worked great for the most part. However, I just tried to make a backup copy of RV and Silent Hill and I got an error message part way thru and neither would decrypt. I am not a computer geek by any means, but would really appreciate some help and advise in layman's terms. Thanks. I'll change that rating if. ...anyone wanna tell me why this computer that USED to run this program easily is freezing. I've also tried DVDFab as well. Granted, it was last year when I last used the same version on this same computer (no hardware changes). I'm wondering if any of the new news of 32bit and 64bit Vista Blue Ray HDTV blocking is trickling down into security updates of 32bit WindowsXP Home Edition SP2? Something that already gone and went "unnoticed", know what I mean? That language Microsoft uses with the bottom line (like the geniune XP update). I am using Cyberlink DVD Player 3.0 and that "validated" my my DVD drive and conformed it to playability, a software not on the computer last year. The one thing I did notice now and then is that despite getting the entire video to DVD (remember this computer is freezing as of tonight), a Sony DVD +/- R and into a Sony DVD player (from 2003) that plays those formats is not easy. In fact not one DVD I've made will play in the standalone DVD player...any ideas? Sorry about the official site and all that wonderful info being lawsuited into the graveyard. Them big execs should've been HIRING the maker. ....Remember Cool Edit Pro by Syntrillium? They are the only company right now I can remember that had no problem installing their software on multiple PCS FREE so long as one bought copy was registered, heard it direct from them vocally too. I'd never heard of this program till early 2006. I love it. It's no longer being developed but that's rarely presented a problem for me. It does what it was designed to do and quite well. And it's far more efficient than a commercial alternative I bought (123 Copy DVD), but the latter has come in handy for the occasional DVD that DVD Decrypter can't handle. All in all an excellent program. I suspect it will stay that way till the studios catch up. If I can copy my CDs and Video Tapes for my own personal use, why not my DVDs. The DMCA is bogus. It was the the best, its not supported any more. the big guys came after him. http://www.cdfreaks.com/news/11914 I use LG's OneClick to fit the movies on one cd. The link in here saying he has a new site is a lie, its and addware site. For new movies I just started using DVDFab Decrypter. It copies entire DVD movie to hard disk, and removes all the protections (CSS, RC, RCE,PS, UOPs and Sony ARccOS) while copying. http://www.dvdidle.com/free.htm The free version actually has worked on all the new dvds I have tried. The down side is it has no features you have to buy the upgrade. I use LG's OnClick to put it on one DVD. I probably will get the commercial version, before the big guys put them out of business as well. I also have DVD 43 and DVDxcopy, they work fine, but not on the newer movies. Good luck.. So, I decrypted my DVD and now I don't know how to get it on my iPod video. Please help! (preferrably by email.. boardk2@hotmail.com) I'm using a PC. -Lord- and houstonguy5 talked about how to fix the file size with dvdShrink - I use this approach and it works great - just started having problems with both programs giving an IO error when trying to read new DVD's. (new copy protection)? Trying to use DVD Decrypter and have it ignore "Failed to read Sector" errors after 3 attempts. mount the image you just decrypted, load it in dvdshrink, and let it run. save the resulting ISO in another filename and you're done. could anyone tell me how to reduce the file size. i hav a file which is more thn 4.7 gb tht means it can't fit into a normal dvd. could someone help me on tht. Surprised noone has yet answered the question from April 6th about this software in that particular review. It goes something like, "Can't rip Memoirs of a Giasha or Capote". The reason is that DVD Decrypter doesn't decode Arcos copy protection which is used on all Sony DVDs after Lords of Dogtown. In order to rip a sony dvd, you need either dvdfab decrypter or a program like anydvd or dvd43 to remove the arcos and then run dvd decrypter as normal. Hope this clarifies. Oh, and 5 out of 5 because without DVD Decrypter, where would all other dvd ripper programs be? ok so the only problem i have really isn't with the decrypter, ut when i burn the dvd with dvd shrink, and play it in my dvd player, the dvds usally skip like crazy. but if i play the dvd on my laptop, it plays fine. i tried to low the write speen down to 2x before and that still didn't help. why are my dvds doing this? DVD Decrypter has not been updated in a long time, mainly because the author was forced to quit all activity on decrypter. You still can use this wonderful software for other things such as games & older movies. Look around in file forum...you will find what you need. I have a question? I have been getting a message when I am decrypting a few DVD's. It as for me to select a country code. So I select US/Canada and then it will not decrypt properly its keeps coming up with error-retry, ignore, cancel? Why is this and what can I do to avoid it? I happend on movies such as "Memiors of a Geisha and "Capote." Please help me! I have a question? I have been getting a message when I am decrypting a few DVD's. It as for me to select a country code. So I select US/Canada and then it will not decrypt properly its keeps coming up with error-retry, ignore, cancel? Why is this and what can I do to avoid it? I happend on movies such as "Memiors of a Geisha and "Capote." Please help me! Other than that it works great and I am very happy. I see some users have already ask questions similar to mine. I am looking at decrypter 3.5.4 and have some questions. Please can anyone help, I've used this program on other computers with no problems but on my Sony Laptop it dosen't seem to work. What does this message mean?? Everytime I go to put something on a DVD this comes up and it keeps ruining my disks!! (when i go to use them again it says "disk not empty"
Then try using it.if you still get the error you may have to try different media.You can check if the media is compatible on the manufacturer website. A: make sure your firmware for your burner is the most recent one.You can download latest firmware from the burner manufacturer website. I've never had a problem before just this week. Can anyone please explain what i need to do? This software is great and always works when I can't get DVD Shrink to work on a movie. They should team up with DVD Shrink! Was great but it's been replaced on my system with DVD43. DVD43 is just like AnyDVD, real time decryption, except it's free. So let me see... Software is automatically "better" if it's cheaper? Who is the "deluded" one? AnyDVD has features and capabilities that DVD Decrypter does not. Deal with it, cheapo. This is a little late for a review. But this has to be my all time favorite freeware app. I was sad to see that it can't be developed anymore, but it works well anyway. When I get a chance, I'm going to donate to the developer for futhering the new burning software. R.I.P. DVD Decrypter. are quite a bit better, as it aint free, dvddecypter is free and is still the number 1 solution to back up you original dvds to protect them. It is superb and excellent! The best there is! In the long run it will need updates to be able to copy new DVD protections, but there won´t be any! That is sad! Now there is a alternative! That is DVDFab Decrypter. It is also a freeware and I think also superb!! This is the best DVD Ripping/Burning Program ever! DVD Decrypter can now be found at: http://www.dvddecrypter.tk There is a new Administrator for DVD Decrypter and he hopes to find a new team of programmers and possibly make future versions of DVD Decrypter. We all know DVD Decrypter is a great DVD ripper, why we need another one? Well, the reason is DVD Decrypter's development has stopped, so it will not support newer version of Sony ARccOS protection automatically. Fortunately, DVDFab Decrypter is always updated to support latest protection, so you can backup your DVD movies to hard disk as before. For example, Movie 'Closer' cannot be copied by DVD Decrypter automatically, but with the help of DVDFab Decrypter, you can copy it without problem. RIP. One of the greatest apps ever. Thanks for the memories L.U.K. The Dvd Decrypter Project is dead due to unforseeable causes... F**k Hollywood majors, we will never die. Thankfully it can still be downloaded here. RIP DVD Decrypter. The popular DVD ripping tool DVD Decrypter has ceased all activities following an order by an as yet unnamed company. It is thought that it could be Sony who have served this notice, as it is rumoured that he broke their new copyright protection within 72 hours of its release. The author of the program, known only as LIGHTNING UK! had originally put up a notice on his website but that has since been taken offline. Needless to say it was one of the easiest most reliable programs to use. Here is the advice from the Author of this great software. Please to turn off the Check Update feature,if you continue to use this great software. All the best Lightning UK. Thanks. CONGRATULATIONS! Way to Go, Richard! You guys are producing a really GREAT piece of software. It works for me everytime and it's so effortless and efficient. Couldn't do it without you. Since I've been using it regularly and have now shown up for my first update...I'm realizing support is in order, so I'm sending over a contribution to you via PayPal as a way of saying thanks and to reward your efforts. Keep up the good work, guys & gals... you ROCK! I think this is the best DVD to Hard disk program ;) I have been never freezd until the ripping :D This is the best, because it works! Well Well, just downloaded, installed and ripped. Talk about something easy that works great ... great work .. thank you. I have this program set to automatically start when I insert a DVD. It is simply awesome. It has been able to handle 99% of the DVDs I throw at it. WOW, I have never used another ripping program, but I have installed many freeware programs and this was the best that I have found and used. At first I was perplexed on how to use it, pressing the big button just looked too easy. I later realized that pressign it got the program started. The whole ripping was very fast in my opinion. The movie looks great and although the files are very large they will remain in my comp because I love having back-ups to my favorite files. This is a great program really. Just the best straight "ripper" available. As a freeware prog, its quality simply boggles the mind when $100 software pkgs, even entire OSes routinely ship with gigantic bugs that "we'll ship the patch as soon as people complain...", it's amazing that one person is able to produce highly quality software and charge nothing...! DDVD can't be beat for what it does: ripping your movie from disk to hdd and defeating all current rights destruction technologies used to keep consumer from exercising their rights under Federal law (this applies to US citizens only; have no idea about UK, EU, Japan, etc). It has many helpful features as well as three ripping "modes." Definitely explore the Settings dialogue and check doom9.com for a good user guide. DDVD also generates a highly detailed log for each movie. This is very important in case issues come up that you need help with. Save it for posting and you can often get answers to your questions very quickly from the user's forum. With this and DVD Shrink, just about anyone can be protecting their DVD investment from Hollywood and KGBPAA greed in minutes. REMEMBER: it's your right as a consumer to protect your investments--i.e. the billions we pour into Hollywood's already overstuffed pockets--by creating an archive copy. According to Blockbuster Video the AVERAGE rental dvd lasts 12-13 rentals, the average kid's dvd lasts 3-4 rentals, before they become unreadable even by set-top players. Nobody listen to the post below. It isn't LUK and is just trying to scab some money off you. Do not go to the website he posted. It is just a fake. It is a scam! excellent prog,best free dvd software and brilliant for all those dvd's, however when will it become skinable? Just perfect. A freeware rarity! Stable, full of functions. I especially like the disk image burning, over any Nero or such... Dont try it, adopt it! This program is an integral part of almost anything I do in the realm of DVD ripping. It works great, does just what I need, and does it well. This guy deserves a donation. How can this possibly be less than a 5? Great Program! This is a must have program if you own a DVD burner. If you use it with DVD Shrink and Nero 6, you will get 100% use from your DVD burner. Absolute magic and its British! By the way, who was it that released a "cracked" version of this program? Its freeware you plonker and doesn't need cracked. While I'm on the subject, may I thank the author for doing such a great job and for keeping it free. Thankkkkkkkkkkkkkkkkkks!!! man oh man what a program...! The BEST of BEST !!! DVD Decrypter is the mutts. Does everything you need and nothing you don't. Note to any other users, -- If you want to make perfect copies of your ripped files then i highly recommend Clone DVD version 2 and above by Elby. It compresses to a 4.7 Disk accurately and also strips out the dual layer coding which always messed up my burns on other software. Combine the two and you've got all you need. i've been using this program since version 3.1.7.0 and it has only gotten better and when i needed help with (which was rare occassions) i found that i've gotten better tech support than for services that i've paid for. this is an awesome program and easy to use for those who are having trouble i suggest you read some of the post in the forum it is definitly worth the trouble. Don't let this awesome software slip through your hands, great job UK Lightning look forward to new updates and improvements. The way this thing chews through a scratched dvd with pure force is sensational. I just wish some the error handling features were in DVD Shrink. Top notch for everything on dvd. An absolute Brute - 6 stars. This is the best one-click dvd ripping solution. Also offers a very nice image burning interface as well. this is the first time im using dvd-decrypter because i just got a dvd burner for xmas. i love it...it is a very powerfull program and makes backing up dvd very easy. This program makes Lightening look like a man with a clear mind, talent, and a clear mission. It could easily be the best DVD ripper available. This is simply the most awesome dvd ripper of all time, it does everything you need and more;in addition it is great for PS2 games. Great program! I use it to make backups of my purchased dvd's, does that great. I also use it to extract the files from my DVR for backup. I use a filter from cableboxfilters.com and that lets me get the ppv and on-demand stuff, then i use this to encrypt it. Only thing, I wish it could shrink the dvds. O well, good program. *the* tool just got better! This is a great program and its free! Fantastic software, I have had trouble backing up badly damaged DVDs and this program sorted them out brilliantly. Has a plethora of features, so even the most advanced DVD ripper will find the feature they will require. Great support for variety of DVD writers, and best of all free! DVD Decrypter is a very powerfull program. It was able to rip a very heavily damaged DVD-disc that other (paying) programs couldn't rip and would just crash ... very impressive! Like the reviews posted below, this program along with DVD Shrink work flawlessly! DVD Decrypter + DVD Shrink == pure awesomeness. Did I mention that both of them are free? There are two programs that can be used to backup a DVD: DVD Shrink and DVD Decrypter. They are both WONDERFUL, both freeware, both easy to use, and neither of them is bloatware. Which one do you need? I would say both of them. DVD Decrypter has a better error handling: if the DVD is scratched, you will need it. 3 thumbs up! DVD Decrypter is a true "1 File Wonder", meaning it can be installed, the EXE copied, and then uninstalled. The EXE will run alone from any folder. It does just what I need it to do, no more, no less. The only thing I wish for is a no-install zip file. This tool is great, useful, stable, and it's free! What else more can you ask? Perfect software. Fast, free, does everything it is supposed to. Among the finest of all freeware. Definatley recommendable. Still the best, and another HUUUUUGE changelist. It's the BEST and it's FREE ! I use this to rip and then use either Nero or Roxio Easy Media Creator to shrink and record. It has worked where 321 Studios X Copy was reporting read errors and refused to copy the move. This is terrific software. You find me a bug and I'll give you a lollipop. While you're at it, find me another free util that does everything DVD Decrypter can do. Sorry, what's that? Oh right, you can't! Personally, I think you've just been sent here to attack the program and have probably never used it yourself. BAD REVIEW. Combine this little gem with DVDShrink and do you really need anything else?? A must have for working with DVDs. i pity the fool who doesn't give this program a 5/5! paypal people... it's really worth it !!! does anybody know some good websites at which to download movies (free)? and does DVD Decrypter only copy movies that are in one's DVD player? Who the heck kept this program from being a 5.0??? I'm heading for Paypal to donate again. This is the best app to rip a DVD. I like how the author always improve and add new features. The best part that it's FREE! This just gets better and better. An absolute must have! ok let me get this straight , this app gets a 6 out 5 stars !!!!! OMG i love this application, i can burn dvds with no problems......The Best...... U cant live with out this program. This app is small, to the point, does the job extremely well, is updated regularly, and is given away for free. The author deserves donations. very nice. even includes dvd-writing software so that images extracted with it can be written directly. Best tool out there. Simply the best DVD ripper. It's the only one I've tried that hasn't produced an error, even when ripping a scratched disc. Here's a freeware project worth donating to. It just works everytime. Nice and easy with a clean interface with little effort involved from me to get it to do what it does best. Uh huh! All I can say is it's small, it's clean, and it has never failed me yet. DVD Decrypter is a pleasure to have around. Whenever I have two dimes to rub together, I'll send one to the author. A truly superlative piece of software which along with DVD Shrink, VirtualDub and TMPGEnc easily rival commercial offerings. Excellent program. I think I will donate too. I use anydvd and clonedvd to backup my dvds. Those of you who havent tried that, ought to. It's THE easiest way to copy your DVD 1:1 (there is some loss of quality reported in clonedvd as there is a quality bar), but I've never actually seen the loss when I play on my home dvd player. But then again the quality bar is always in the green (and I include all menus). Clonedvd and anydvd are excellent investments for anyone the slightest bit worried about their DVD collection. I have a question: I have a few divx, avi, mpg files I'd like to go ahead and stick on a dvd or cd and be able to play on my dvd player... what's the best tool to do this? It doesn't have to be free. Just the best. Please donate if you can. We need to encourage good freeware. The absolute best / comprehensive ripping program I've ever used. Paired with a great encoder, top quality DVD movie backups can be made. And it's FREE!! One 2 words to this awesome program!! It's really fast and very reliable. Highly recomended for every kind of work from decrypting to recording!!! Keep up the good work people!!! It's tough --- very tough --- to imagine a better program. I just hope that with all the improvements DVDDeC does not turn into just another bloatware. That's what happened to Nero ROM. I'm reminded of Pareto's Law of 80/20. 20 % of the features are those used 80% of the time. And while this program is as nearly perfect as anything has the right to be, using kaizen to get that 20% even more perfect is better, to my small mind, than expanding on features that look great on paper but that do not contribute much to the 80%. move over smartripper, DVDDecrypter got the game on a whole new level now :)) hell, it deserves 6/5 ! excellent software !!! It's hard to believe that such a fine piece of software is free. Never any problems with this third-party interacting with Windows XP. Cannot say enough good things about this decryption program. I would gladly pay for this program. I hate this program, is soooo good that my HDD space is going away but ultra fast. damn you decrypter, now I need more dvd+r's and a new Hard Disk. Why you make such a good job?!?!? really its great! best DVD Ripper available, too bad that Smart Ripper isn't developed anymore, but this one rockz and best friend for the cool freeware DVD Shrink 3.x! And this is still freeware, too! Fantastic! this is the ultimate ripper, it is simply awesome, more power to the author. Pain_Man, Nero Recode does not need plug-in to encode in MPEG4 (and it's the main task of Recode). I'm running my first test with DVD Decrypter. Heretofore, when backing up my huge investment in DVDs to store them offsite--with a five K deductible on the homeowner's insurance, I'm not going to lose my entire collection. Besides, two Supreme Court precedents gives us the right to back up "entertainment" content and data. Anyway, regarding Nero Recode. It doesn't come with a DVD/MPEG-2 Decoder. You have to buy one for $20 from Ahead (Nero's maker) or, may be, one will magically fall into your hands. So far, magic ain't working, and Ahead isn't extorting $20 more bucks out of me when freetools do the same job. These Krauts must think we're idiots. So do NOT download trial versions of Nero expecting Recode to work; it won't without the $20 plug-in. Just thought I'd warn those of you who were considering doing this. don't get me wrong. I love Nero and I use Nero ROM Burner to burn all my CD/DVDs. But they will gig you for extra bucks (just as Intervideo does with WinVideo and Interactive. The latter is supposedly free. But if you pay $70 to get the excellent WinVideo Platinum DVD player, you to pay $19.95 to connect their "freeware" to a product you've already paid 70 plus for! These companies, I swear. No wonder pirated software is pandemic. People get tired of being endlessly ripped off by "upgrades" and "plug-ins" convienently left off the information when you're forking over the bucks. That's my rant. This program has everything that DVD Shrink doesn't. I use it for all my image burning and ripping. NICE WORK! This program is the very best for ripping dvd's and it's so easy to use I give it 10 out of 10. To the person who can't find nero recode try a program called dvd2one it compresses a 7 or 8 or 9 gig the dvd down to 4.36 gigs then use Imgtool as long as you have nero installed to burn out your dvd. You will then have a perfect quality full version dvd copy with all the extras too. P.S Go to http://www.nero.com/en/nero-prog.php and download Nero express and Nero Vision express trial and you will find Nero recode in Nero vision express. It automatically detecs DVD's in the drive for you, and displays the contents of the VIDEO_TS folder for you automatically. One click of a mouse is all it takes to begin the ripping/decrypting process. The output works flawlessly in Windows Media Player (assuming one has all the proper codecs). Process takes about 30-40 minutes for a full DVD. Combined with DVDShrink for compressing oversized video to fit on a DVDR5, this makes for one powerful combination for backing up your DVD collection. DVD Decrypter is the best. I like to use CloneDVD to burn after the rip. Forget all others rippers. This is the one. Download now. The best dvd ripping software I ever used!!! Absolutely brilliant! once again the U.K. leads the way. This is the best tool i found allso to burn bin & iso files very easy and reliable. easy to use no need big resorces small program big utility. Wow,this is the best software out there!Although there is a little flaw, no doubt i'd recommend DVD Encrypter to all. Oh Gosh!!!! I need another hard drive ...... again!!! Does anyone know if this problem can be overcome? This program is outstanding... Free & Great! So easy 2 use... makes DVDxCopy look stupid... Also try DVD Shrink if you like this prog! THANKS! First thanks for this FREEWARE. I am a student and I have a DVD-ROM, but not a DVD burner. I work under WIN2000. DVD Decrypter works stable and I can it use easy. A good tool and nice, that I can work with it FREE. This is awesome software. Combined with Pinnacle Instant Copy one could copy an entire dual layer movie DVD to one DVD+/-R/RW with only slightly noticeable compression quality loss. I'm using this software on Win2k for ripping movies to my HDD (using the file mode of the soft). Moving on 2k is for me the best way to get stable under an overclocked computer for every software i use, and for this one too, it has never crashed. The interface is sober, you have just what you need under fingers, it will decrypt the DVD if encrypted, remove the macrovision, and write unprotected files on your hard drive (knowing that a DVD doesn't contain only one big file but several *.vob *.ifo etc... rarely more than 1Go each). The software is also intelligent : it choose for you by default the only files needed for the main movie, reducing the amount of data to write. Moving and decrypting files to your HDD took arount 40min (using pioneer 106s drive on an xp2400+ with 80Go HDD). Easy to learn, this software is well desined and rock stable and i give it 5/5. And it's freeware, but take 3mins to give 10 bucks to the author to thank him for the job. This program simply rocks. The author has done a great job. easy to install, and it works! unable to get program to run...input/output error. Deffenetly a good programm ! What can I say. The best out there bar none! There is no need to install any ASPI drivers on Windows XP Pro. I have also read some comments here. The problems with the 4gig limit size is because of the O/S your running on. You need to switch over to either Windows 2000 or XP Pro running on NTFS to overcome this problem. Bacause there is a 4gig limit on Win98/ME on FAT32. Another great thing about the program that most people don't seem to realise is you can create an ISO image using this program of your DVD's and use this same program to burn them back to your DVD writer to play in your DVD player just like the original film complete with all the Menu's. At the moment this is limited to small 4gig films because there are no 9gig blanks for sale at the moment. But as soon as these become available for sale you will be able to use just this program to rip yopur DVD,s and burn them all back to disk again. Its just a matter of when the blank 9gig DVD's become available for sale. Which is closer than you think! I find it very simple and impressive. Can anyone send me suggestion about the 4GB file limit? Excelente program for Backup your DVD movies less than 4.7 GB !!!!! Works pretty good....No complaints...Makes good Rips too,,Can play it with PowerDVD without the disk inside the DVD by clicking on "Open Media files"
This program continues to be the best for decrypting dvd's. For the guy with speed problems. Are you overclocking your FS bus? I had trouble until I reset to base speeds. Seems to use FSB as reference or something. Good Luck. this program is just so incredibly exellent its not even possible to describe how exellent it is..! Used it to make isoimages of near 200 dvd's onto HD.. and a little program to let a remotecontrol mount and unmount images using DaemonTools and guess wat u got.. INSTANT DVD ONLINE... ! Brilliant.. stuff! ---- I vote for higher ratings.. 5 isnt nearly good enough for DVD Decrypter ! DVD Decrypter is the best program of its kind, in my opinion. It makes the ripping of VOB files effortless. I haven't encountered a single problem while using it (and I use it often). Many thanks to its creators for this great free program! All you have to do is open your software dvd player with the dvd in the drive and when it gets to the movie press pause and open DVD Decrypter and that should fix it. I love the program guys. Keep it up!!! E 01:38:38 Unable to initialise ASPI manager! I ran into light_uk on irc and he mentioned his program. I have been using it since to keep my 2 day rentals for a few weeks instead on my firewire hard drive. It works awesome and i use the iso mode in combination with daemon-tools. settings to slow down the speed of DVD? I'm developing it in XP - works fine here! If you are having problems and would like me to help you sort them out, go to the forum on the official website. has anyone else had trouble running this on WindowsXp ?? I get nothing but garbage on XP.. but Win9x works great!! I use it to rip DVDs so I can watch them on my laptop, which doesn't have a DVD player, good for those long trips. OrlandoTommy then you wouldn't be able to create an inexpensive dvd jukebox system with a $400 pc with a couple of cheap harddrives. A five disk changer will cost you about 250 (set top) and I have no idea how much that 20 disk changer with the firewire will cost but I'm sure it's way outa my range. Wouldn't it be easier just to put the DVD in your DVD drive on your PC and watch the movie? FLASKMpeg works a treat (using DivX Codec) then touch it up and make it a little better with VirtualDub (i think that is the name) to make perfect DivX movies. How is this program not illegal tho? it basically does what DeCSS does? Great app. First time that I have tried to rip a DVD and this program did it perfectly even for a beginner. Now if I could only find a decent program to convert the .vob files to mpeg/avi.... Nothing I have tried will work in XP with my system... Any Ideas? ran flawlessly...may have to use this instead of SmartRipper now. Friendlier interface, did what I asked of it. One thing I don't know any actual USEFUL applications would be the merging of vobs.